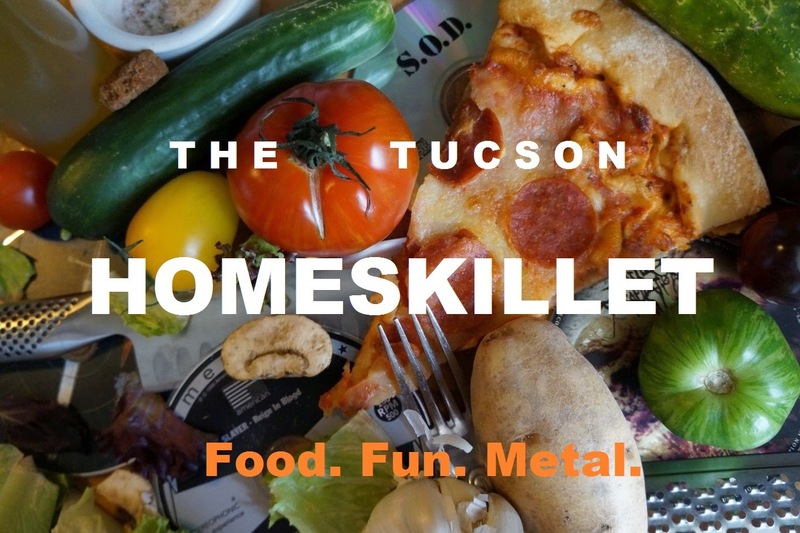 The Tucson Homeskillet: What I saved and ate from the depths of the freezer and vegetable drawer. What I saved and ate from the depths of the freezer and vegetable drawer. The “What I found dying in the crisper and freezer” quick dish. Here's the thing: I really, really, hate to waste food. It's just as bad as wasting time, or money or hopes that the new Creed album is gonna be “just dynamite!”. If I buy the food, you better believe that I'm gonna use the food. Well, sometimes that just doesn't work out. The other night, as She-Ra was pulling in yet another double, I decided to check out our over stuffed vegetable crisper. Post holiday shopping and stocking, our little cabinet at the bottom of our small jammed-to-the-max fridge was beginning to get annoying. I could see tops of celery peeking out of the opening and the tips of plastic storage bags filled with radishes, half a cucumber and arugula kept getting caught every time I closed the thing. Seeing as I was getting ready to cook a nice hearty meal for when She-Ra finished work, I decided to go through the veggie drawer and see if I couldn't consolidate or even toss out some of the stuff in there. Most of the produce was good. Recently purchased, cleaned and stored properly in airtight bags or those crinkly plastic bags you throw them in at the grocery store; the bright greens, reds and yellows of the vegetable collection was waiting patiently to be used and appreciated. Then...I got to the bottom of the drawer. Underneath all of the good stuff was a straggle of questionable and obviously forgotten food. I tossed the withering lot onto the counter top and when I was done I closed the drawer and the fridge and surveyed those that were left behind. It broke my heart to get rid of such decent produce, although their time of acceptance was pretty much past due. Sure, normally I'd just throw them into the bin and be done with it. But then, as I looked down at the sorry bunch, I got an idea. I then opened the freezer, reached way in the back and found what I had thought I saw a day or two ago as I was shoving chicken breasts and recently made stock into the cramped and frigid space. There, on the counter, was what could be a fair, but not very interesting, dish. So, to warm up before doing the “real” cooking, I threw together this quick meal of almost dead produce and a left for dead item from the freezer. I immediately tossed the chicken into a bowl and let warm water wash over it, saving it (just barely) from the terror of deep freeze burn and to expedite the thawing process. As it thawed, I cubed the potato, diced the tomatoes (which was rough seeing as they mushed even under my uber sharp serrated knife), cut the onion into thin slivers and finely chopped the peppers and scallions. Once the chicken was thawed and, to my surprise, didn't look all that bad, I cut it up into about inch sized pieces. I placed my skillet, which is a sort of half wok/half frying pan, on the stove and added the olive oil and garlic before turning it on a med-high heat. Trust me, in most cases, you want to add your oil and garlic into your pan before you turn it on. This prevents burning and the flavors don't get destroyed. Then I added the onion. Then the potato. Once the onion was translucent and the potato was kinda soft, I added the tomatoes and red peppers and kept mixing and mixing for a few minutes. At the last minute, before adding the chicken, I threw in the scallions. Now, the thing that came to my mind was that everything that I am using in this here “I refuse to let food go to waste” quick dish is that no component or ingredient would be the main feature. The chicken had been in the freezer for, whoa, I don't know how long and the veggies were sadder than a Pixar movie. (Just to note, I love Pixar movies it's just that, well, they always make me cry, so....that's what I meant) So, essentially I was making a sort of weird curry or rendered gravy for the chicken because, lord knows, it was meant for far better things a long, long time ago in a recipe far far away. After turning the chicken over a few times over the course of, oh, let's say, 10 to 15 minutes, I checked the chicken to see if it was cooked properly. To my surprise, it was tender and juicy. I know. Not the most attractive thing but, you know what?, it wasn't half bad. In fact, after adding some more spice, salt and a wink of hot sauce, it was actually quite tasty. So I put it in a tuperware container and had lunch for tomorrow. You did what you could and you did your part. Good luck everyone. And have fun....which is exactly what cooking is!